Sue and Mike are a retired couple who have lived in France since 2003. Although born in England, we both spent most of our lives in South Africa and in fact moved to France to run a small hotel and restaurant in the South-West; this proved to be hard work! We are now happily settled in beautiful Provence. We have always loved Provence and find it an ideal place to live with a great climate, ease of access to Nice and its airport and a huge variety of things to do. Our villa (and the studio) are well situated on a quiet road but very convenient for all the local facilities. The studio really offers a special vacation as it is very private and our guests have the pool almost to themselves. Shower and basin with the toilet separate. (The guest suite if rented separately has a shower and toilet). The living room area of the studio has a sofa with upholstered cushions and coffee table; T.V. (UK free to air channels) ,radio/CD/MP3 unit. The dining area (as well as the kitchen) is also outside. We should have everything you will need. The "Summer Kitchen" consists of a gas hob, microwave/grill and sink. Separate water heater and plenty of preparation space. There is a separate gas barbecue. The owners use the pool from time to time but only when its very hot. We will not disturb your privacy. Outside: We have a beautiful and loved garden and are surrounded by woods on 3 sides. The whole property is very quiet but completely secure. You will have exclusive use of pool loungers and the outside dining room table and chairs around the pool. The pool is 12m by 5m. Cleaning / Towels / Linen / Maid service: All linen is provided including bath and pool towels. Other: We regret that can not accept pets. The accomodation is non-smoking. Mike and Sue couldn't have been more gracious or accommodating. They are exceptionally nice and welcoming people and will make you feel right at home in their little corner of heaven. The pool house is very private. The bed is incredibly comfortable. The outdoor kitchen has all the amenities. It's a short drive to the local bakery, restaurants, and markets. What's not to love! Mike and Sue's pool house studio apartment is beautifully decorated and overlooks their pool, surrounded by trees and wild flowers. It is a haven of tranquillity and only an hours drive from Nice, St Tropez, Gras and Port Grimaud. We loved it! A Star of the Var ! Knowing the area from previous holidays, we chose Fayence as a perfect base, with the Gorges du Verdon, St Tropez, The Esterel Coast and Grasse all within easy reach and Nice airport less than an hour away. Sue and Mike are perfect hosts. Nothing was too much trouble and whilst they were on hand to advise, they were not intrusive and allowed our family to have some rare time together (my daughter used their charming en suite room in the main house). Sue's artistic touch to the comfortable and well equipped accommodation is evident and Mikes humour and care of the pool and surroundings all make for a perfect place to stay. 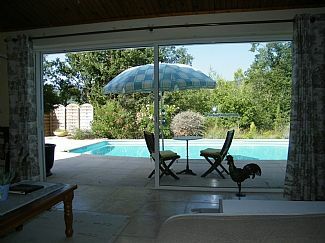 The pool is the highlight of the place, it is simply superb and the gite itself was spotless and well looked after. Fayence has an impressive supermarket and, like the nearby Seillans, is a pretty village, well served by a variety of restaurants. A car, however, is a must as both villages are more than a short walk away. Overall, this has to have been one of the best holidays we can remember and one that we would dearly like to repeat! Simon, thank you very much for your kind and thoughtful words.We enjoyed having you and your charming family as guests just as much as you did;great that you made the best of evey moment of the fortnight. We will miss you, Mike and Sue. It was exactly as described and easy for us to find as we were given excellent directions. It was beautifully presented and very clean and tidy with everything provided. The pool was fabulous and we had it all to ourselves which was a great bonus! It was set in beautiful gardens and Mike and Sue made us very welcome and gave us great advice about the area. It was perfectly positioned to explore and within easy reach of Fayence and Seillans which are charming villages. It was the most relaxing holiday we have had and hope to return soon!! We were very well looked after The pool and gardens were maintained perfectly throughout our stay and we enjoyed sole use of the pool on our visit. We didn?t cook much, but the kitchen facilities are great and there is a large BBQ. There are plenty of guides, maps and recommendations materials in the Gite and Mike and Sue were on hand to provide helpful info when needed. As my French is weak, it was really great to have English speaking hosts. We did a fair bit of traveling on our trip and the accommodation provided the perfect hub ? (pretty and peaceful) to explore the wider area from. If you are considering this property I suggest you book imminently to avoid disappointment ? due to a late booking we were only able to secure one week and were very sad to leave. We look forward to visiting again soon. First trip to the south! What a lovely stay we had with our son at the Git?... We habitually stay in the Limousin region but following the terrible weather we decided to drive south for a few nights. It was a great decision, both Michael and Sue were welcoming hosts and were kind enough to pass on their recommendations in the local area(s). The accommodation was light, airy and very clean. The local towns offered much in the way of the French cafe culture without selling out commercially and were sensibly priced. It was a great place to visit and ideally situated for both scenic and beach stays. The outside summer kitchen was a great idea and on the hot nights was a great place to cook and keep separate from the 'living' quarters. All in all I would thoroughly recommend this to friends it was comparatively cheaper than many of the other Gites we looked at and was of a much higher standard. Great job Mike & Sue, no doubt we will see you again! We are 50mins from Nice airport which offers flights to most major European airports. A car is really essential as public transport is minimal. We are 2/3 kms from Fayence and Seillans and the 3 other villages are a bit further down the valley. There are plenty of supermarkets and restaurants within 10 mins drive. Cannes is 40 mins, Nice 50 mins, St. Raphel, Grasse, Frejus, Antibes, St Maxime all under an hour away. St. Tropez and the Gorges de Verdun are a bit further. Our local lake St. Cassien is 20 mins drive. Mons 20 mins up the mountain is also lovely. We only accept bookings by the week with a Saturday change-over date. The only exception to this is at the very beginning and end of our letting season ( May to September) or if we have a free period. Changeover Day: Change-over date is Saturday. Departure time is 1000 and arrival 1600 hrs. Notes on prices: Prices quoted are for the studio only and are all inclusive for the items specified and for a stay of 7 days.